This light, known as the cosmic microwave background, or CMB, has journeyed across the cosmos for 14 billion years — from the moments immediately after the Big Bang until now. Because it is brightest in the microwave part of the spectrum, the CMB is impossible to see with our eyes and requires specialized telescopes. 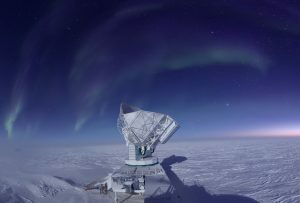 The South Pole Telescope, specially designed to measure the CMB, has recently opened its third-generation camera for a multiyear survey to observe the earliest instants of the universe. Since 2007, the SPT has shed light on the physics of black holes, discovered a galaxy cluster that is making stars at the highest rate ever seen, redefined our picture of when the first stars formed In the universe, provided new insights into dark energy and homed in on the masses of neutrinos. This latest upgrade improves its sensitivity by nearly an order of magnitude — making it among the most sensitive CMB instruments ever built. “Being able to detect and analyze the CMB, especially with this level of detail, is like having a time machine to go back to the first moments of our universe,” said University of Chicago Professor John Carlstrom, the principal investigator for the South Pole Telescope project. 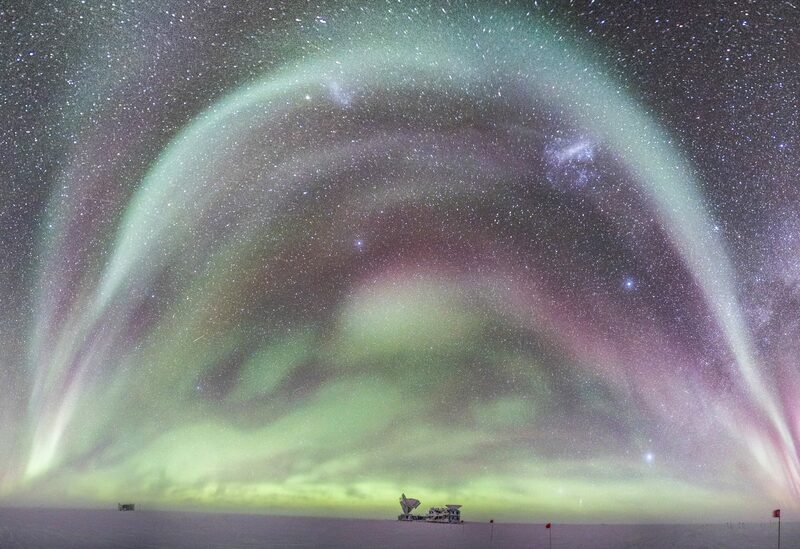 Located at the National Science Foundation’s Amundsen-Scott South Pole Station, the South Pole Telescope is funded and maintained by the National Science Foundation in its role as manager of the U.S. Antarctic Program, the national program of research on the southernmost continent. The telescope is operated by a collaboration of more than 80 scientists and engineers from a group of universities and U.S. Department of Energy national laboratories, including three institutions in the Chicago area. These research organizations — the University of Chicago, Argonne National Laboratory and Fermi National Accelerator Laboratory — have worked together to build a new, ultrasensitive camera for the telescope, containing 16,000 specially manufactured detectors. “Built with cutting-edge detector technology, this new camera will significantly advance the search for the signature of early cosmic inflation in the cosmic microwave background and allow us to make inroads into other fundamental mysteries of the universe, including the masses of neutrinos and the nature of dark energy,” said Kathy Turner of DOE’s Office of Science. “This relic light is still incredibly bright — literally outshining all the stars that have ever existed in the history of the universe by over an order of magnitude in energy,” said University of Chicago professor and Fermilab scientist Bradford Benson, who headed the effort to build this new camera. However, because most of the energy is in the microwave part of the spectrum, to observe it we need to use special detectors at observatories in high and dry locations. The South Pole Station is better than anyplace else on Earth for this: It is located atop a two-mile-thick ice sheet, and the extremely low temperatures in Antarctica mean there is almost no atmospheric water vapor. Scientists are hoping to plumb this data for information on a number of physical processes and even new particles. The details of this “baby picture” of the cosmos will allow scientists to better understand the different kinds of matter and energy that make up our universe, such as neutrinos and dark energy. They may even find evidence of the gravitational waves from the beginning of the universe, regarded by many as the “smoking gun” for the theory of inflation. It also serves as a rich astronomical survey; one of the things they’ll be looking for are some of the first massive galaxies in the universe. These massive galaxies are increasingly of interest to astronomers as “star farms,” forming the first stars in the universe, and since they are nearly invisible to typical optical telescopes, the South Pole Telescope is perhaps the most efficient way to find them. 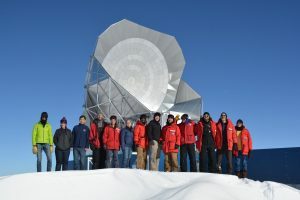 The South Pole Telescope collaboration has operated the telescope since its construction in 2007. Grants from multiple sources — the National Science Foundation, the U.S. Department of Energy, and the Kavli and Moore foundations — supported a second-generation polarization-sensitive camera. The latest third-generation focal plane contains 10 times as many detectors as the previous experiment, requiring new ideas and solutions in materials and nanoscience. “From a technology perspective, there is virtually nothing that comes ‘out of a box,’” said Clarence Chang, an assistant professor at the University of Chicago and physicist at Argonne involved with the experiment. For the South Pole Telescope, scientists needed equipment far more sensitive than anything made commercially. They had to develop their own detectors, which use special materials for sensing tiny changes in temperature when they absorb light. These custom detectors were developed and manufactured from scratch in ultraclean rooms at Argonne. Finally, the new camera was ready for its 10,000-mile journey to Antarctica by way of land, air and sea. On the final leg, from NSF’s McMurdo Station to the South Pole, it flew aboard a specialized LC130 cargo plane outfitted with skis so that it could land on snow near the telescope site, since the station sits atop an ice sheet. The components were carefully unloaded, and a team of more than 30 scientists raced to reassemble the camera during the brief three-month Antarctic summer — since the South Pole is not accessible by plane for most of the year due to temperatures that can drop to minus 100 degrees Fahrenheit. The South Pole Telescope’s multiyear observing campaign brings together researchers from across North America, Europe and Australia. With the upgraded telescope taking data, the exploration of the cosmic microwave background radiation enters a new era with a powerful collaboration and an extremely sensitive instrument. 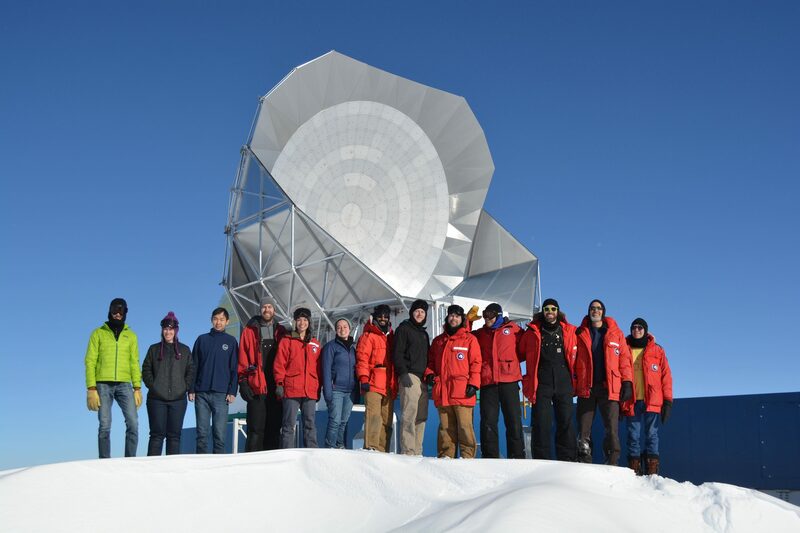 The South Pole Telescope collaboration is led by the University of Chicago, and includes research groups at Argonne National Laboratory, Case Western Reserve University, Fermi National Accelerator Laboratory, Harvard-Smithsonian Astrophysical Observatory, Ludwig Maximilian University of Munich, McGill University, SLAC National Accelerator Laboratory, University of California at Berkeley, University of California at Davis, University of California at Los Angeles, University of Colorado at Boulder, University of Illinois at Urbana-Champaign, University of Melbourne, University of Toronto, as well as individual scientists at several other institutions.